The sun is breaking through the clouds for a few minutes! I hope we have more of it this week than we've had in the past one. Saturday I was at the Lebanon Farmer's Market, which is a lovely market in a very nice location. 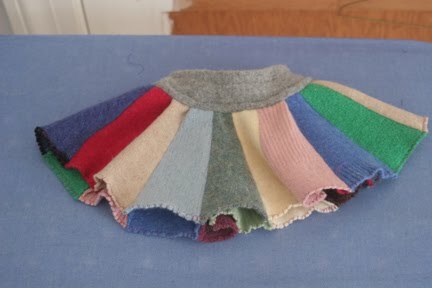 I had a nice day meeting new people, and I delivered the cashmere "big girl" skirt to Rhonda, who is the inspiration for the skirts I'm now making. I'm thrilled that it fit her well and she loves it. While I was at market Saturday my daughter, who is also my "booth babe" at the Coventry market and any others she can get to, raided my scrap bag and made this adorable tiny skirt for some little girl's doll. She's getting good at this! I've enlisted her help in sewing while she's home from the summer, when she's not too wiped from her full-time job. I'm grateful she enjoys it! The Boy and I took a walk at the park early this morning, and he was enchanted by the fluff-balls in the grass by the pond - the ducklings and goslings. I really need to bring my camera so I can show you how adorable they are.